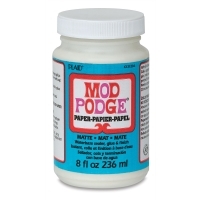 Available in a variety of finishes, Mod Podge is a milky white liquid that dries transparent in less than 10 minutes. Use it as a finish for découpage. It seals and glues in one application. Wipe up spills with a damp cloth. Most applications require two or three coats. Please see the item specs tab for helpful information regarding application and coverage. 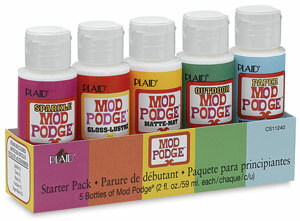 Matte Finish — Choose this Mod Podge formulation when you are looking for a low-luster, satin finish. Fabric Formula — Decoupage on fabric with this special formula. Use it to apply paper prints or fabric swatches to clothing, totes, banners, and more. 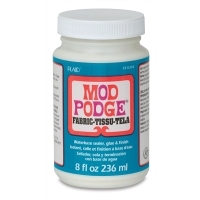 When Fabric Mod Podge is used as a sealer, embellished items are machine washable in a cold-water gentle cycle after 72 hours. Outdoor — Decoupage projects for the outdoors. Seal and protect wood, terra cotta, slate, tin, and more. 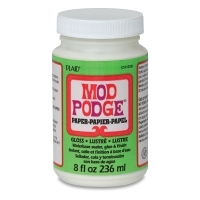 Paper — Designed for paper crafts, this non-tacky, acid-free formula dries clear and holds tight. It's quick-drying so you can apply multiple coats and build layers. Great for papier mâché and scrapbooking, it's available in your choice of Gloss or Matte finish. Starter Set — Five, 2 oz bottles (one each of Sparkle, Paper Matte, Original Gloss, Original Matte, and Outdoor Mod Podge). Antique Matte Finish — Give any surface an heirloom look with this special Mod Podge formulation. Sparkle Finish — The same all-purpose performance of Mod Podge with the added bonus of sparkle — it adds a glistening finish to any project. Gloss Finish — This is the original Mod Podge formulation with a lustrous, glossy sheen. 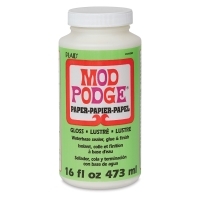 Super Gloss Finish — This Mod Podge adds a super shiny, glass-like finish to your project. No special tools are needed for a smooth, brushstroke-free application.